There is a slight mistake with using this idea as the origins of the Seven Swords of Wayland in that Sigi of the Wolsungas is already here in the legend, leaving only five tribes united by a sixth. However, this account by Snorri Sturlasson seems to verify the fact that the Wolsungas were the Sigambrian Franks, and the the Merovingian Kings of Francland. Even with this slight mistake BF seems to have intuited the vital role of the Wolsungas in the foundation of the English Folk-Nation. The role of the Swedes has never been fully understood in the creation of the English Folk, and more and more evidence suggests a very strong Swedish influence in the 'Anglo-Saxon' times, and there seem to have been far more Swedish Vikings involved in the later incursions into these lands, even down to the most famous Ragnar Lodbrok. East Anglia is a particular area where we find Swedish influence, as well as around the area of East Sussex which has the Long Man of Wilmington. Another important area to Folkish Wodenism is around the Uffington White Horse-Wayland's Smithy area of Oxfordshire (Wiltshire originally). The Swedes are most important in view of their rulership by Ingui and the Inglingas. Snorri's tales are based around these peoples leaving Troy, something that seems to have no truth in it, and is readily dismissed by most scholars. But there is something that I am going to look at now which may give clues to what seems to be nothing more than am 'old wive's tale'. There is a place being made famous though its being the oldest known civilisation in the world (until somewhere else turns up to fit the bill) - Gobekli Tepe. Much is made of this, especially by the Turks; however, it was not in Turkey originally but in Armenia, and it is here we need to discover not only this early civilisation but also some strange links to it. Gobekli Tepe is said to mean 'Potbelly Mountain' or 'Potbelly Hill' in Turkish, being a Turkish translation of the original Armenian 'Mountain Navel', having the interesting name - Portasar. What we do know of the original inhabitants of Armenia, the peoples who gave their name to the area, is that they were an Aryan Nation, being tall, blonde-haired and blue-eyed. This, as with every Aryan Nation, infers they were the Ruling Elite and not necessary the tribal make-up of the whole area. 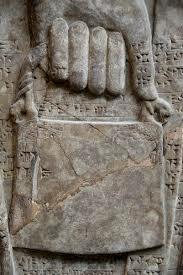 They were the Armen, Armenic, Armanen or Arman which is of interest to us today. Ara/Ar - This was the Sun, Light, Fire and Renewal. This name can be traced back to the 5th to 3rd century BCE. Aralez - The oldest deities who were dog-like gods, or maybe originally associated with the Wolf-Totem. Arpi - Light of Heaven. Ararich - God or The Creator. Ararat - Place of Arar; the name where 'Noah's Ark' is said to have floated to as the flood waters of the Great Flood resided. 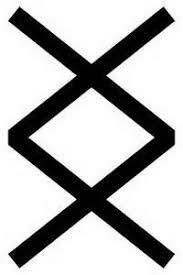 This symbol is clearly an Ing-Rune, but is the Old English Ing-Rune and its shape is unmistakeable. 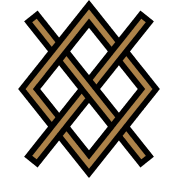 In fact, it also has the 'lozenge' or 'dot' within the central diamond-shape, a feature found in so many of the depictions of this rune, either in this form or its Elder Futhark form. The above symbol also makes the Maltese Cross. 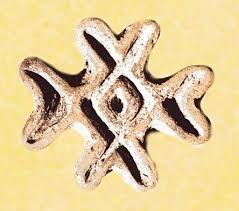 It is also an Ing-Rune and two Ken-Runes each facing in the opposite direction. The god known as Ang(g)gh seems to be one who connected the heavens to the earth. We seem to have here an account of some form of Saxon presence in Armenia in early times. But this is not as interesting as what we can get by reading between the lines. In our Wodenic Lore we recognise the lands of At-al-land in the North Sea which were struck by a Tsunami around 6,000 to 7,000 years ago, this dating taking us to the time around the dating of the above Symbol of Ing in Turkey (which part I do not know as yet so we cannot link it directly to Armenia). We have a dating for the Flood of Noah to around 4,000 years ago, linked to the Hale-Bopp Comet as the herald of this later disaster, or maybe the dates are wrong. Thus, even though the dating is vague we have the presence of this rune, and the idea of the 'Ark' which landed at Mount Ararat in Armenia. 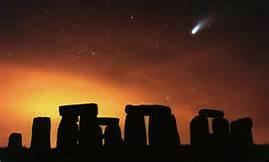 'Ancient stone carvings confirm how comet struck earth in 10,950 BCE sparking the rise of civilisations'. This was about findings by Graham Hancock seemingly confirmed by new findings, but the headline is rather dramatic and obscure since when a comet strikes the earth the likelihood is the destruction of civilisations, and in this case (due to the dating) the sinking of At-al-land (North-West Atlantis). This, of course, would have caused the 'rise of civilisations' at the same time in different areas of the world (after the Great Flood) with the movement of the Atlanteans into various different areas where the 'mini ice-age' that is said to have set in would not have affected them. The dating of Portasar at this time coincides with the destruction of Atlantis. Dog-headed man (similar to the one on the Horns of Gallehus. This seems here to be a 'water-pail' which suggests a 'water-bearer' maybe linked to Aquarius - the 'water-bearer'. 12,000 years ago is around half of a Great Year Cycle. The idea of a Great Flood that wiped out a 'Race of Giants' seems more in line with an era some 12,000 years ago than it does not the much later dating of 'The Flood'. 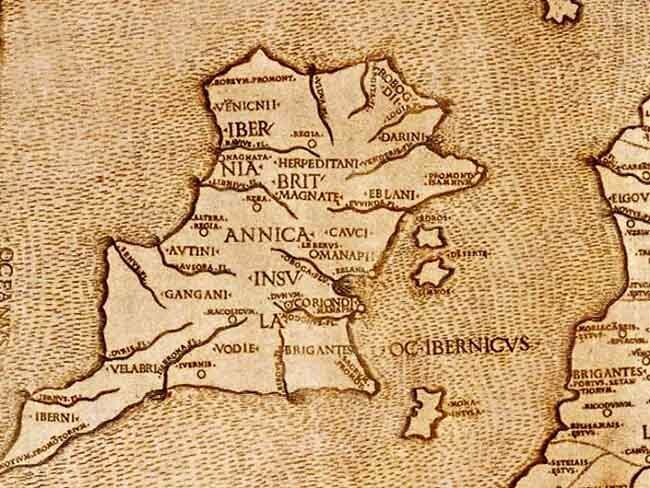 There is also a name Ar-Arda connected to Ardini which is said to have been a religious centre of ancient Urartu (Ur-Ar-Tu). The names Urfa, Urha and Edessa also occur in these areas at different times. There was also an Armenian King named Armanum of the Hay-Armens. Although this area will be claimed as the oldest, it is more likely that it was one of many areas to which the peoples of At-al-land sailed to because of a great flood that sank their lands and the mini ice-age that came upon the North at this time. 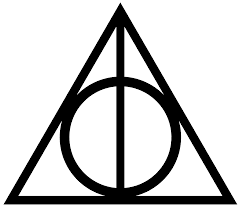 The T-shaped pillars remind me of the Thunor's Hammer turned upside-down, since they are not fully T-Shaped. From what I have read of the findings of this area it seems that this religious complex was deliberately hidden through the whole area being infilled, something that seems not to make sense. Unless, as some have suggested, the symbolism concerning a Great Flood was left as a warning that would be used in the far distant future. Of course, it has been suggested that this whole complex formed part of a 'world-wide Australian aboriginal civilisation' which of course negates everything I have said here. In which case the idea of the Seven Tribes of Ing coming back to these islands to form the English Folk-Nation is absolute rubbish created for 'racist' purposes in order to negate the findings of this 'aboriginal' theory. The English never existed we are told again and again. Or did they? 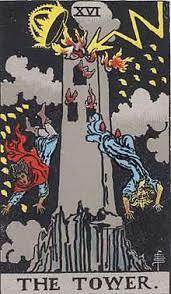 Note 1: The Seven Swords of Wayland is a symbolism we can also use together with the idea of Seven Sages (found in various cultures) who appear at the time of a great cataclysm. The unity of the Tribes of Ing is achieved through the Seventh Sword of Wayland - Albion. 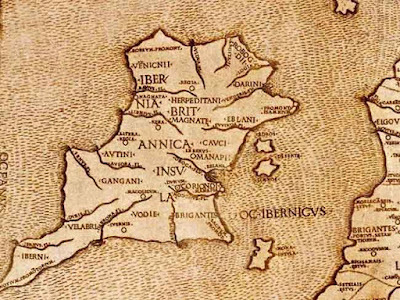 This is the early name of England, the 'White Island' or 'Isles of the Elves'. These are the 'Shining Ones' who dwell in the 'Inner Earth' after the Great Catastrophe, no more to be seen by mortal men. They are the Light Elves or the Tautha De Danaan. The Sign of Ingwe and the White Dragon will unite the Tribes of Ing once more in their direst hour of need. 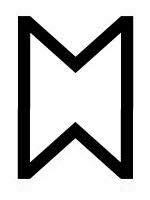 Note 2: The symbol below is the Mark of Nimueh which featured in the 'Merlin' series on TV. 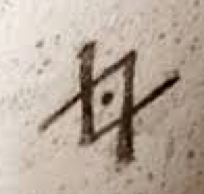 This is obviously the Rune of Ingwe, even down to the 'dot' in the centre. Nimueh was the Dark Sorceress associated with the 'Isles of the Blest' and the 'Old Religion', and she was of the 'Blood Guard' that guarded the Ancient Blood of the Heathen Religion. In some accounts she was the 'Lady of the Lake'. 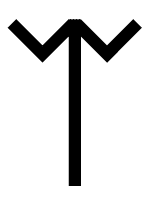 This version is the Ur-Glyphic Ing-Rune as opposed to the Kan-Glyphic Ing-Rune found in Turkey, unless we see the latter as being shown from the wrong angle. 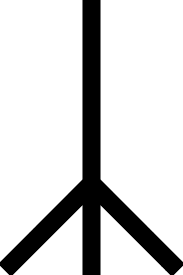 This is the virility-fertility form of this rune.